Kitchen Kompact is committed to environmental stewardship and leadership in the woodworking industry. In our dedication to these practices, Kitchen Kompact strives to provide a safe and healthful workplace for our employees, promote energy protection and pollution control, and meet all applicable Federal and State requirements set forth for the woodworking industry. Our obligation to these policies requires continuous evaluation and necessary changes will be made to further enhance our dedication to environmental leadership and conservation. Here at Kitchen Kompact, we believe in eco-friendly manufacturing processes that will help reduce our carbon footprint for future generations. We understand our role in the environment, and we’re proud of our certifications that prove this philosophy. From our Environmental Stewardship Certification to being TSCA Title VI compliant, each Kitchen Kompact cabinet is not only manufactured with affordability and quality in mind, but also sustainability to the environment. 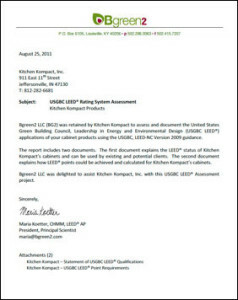 Click the letter to the right and read how Kitchen Kompact cabinets can help you achieve LEED (Leadership in Energy and Environmental Design) certification. Kitchen Kompact cabinets are also TSCA Title VI compliant. To learn more, please click here. Click on the links to the right to read about our ANSI and Environmental Stewardship certifications.